Traffic scene in India is too bad. Rapid increase in vehicle has caused an enormous congestion. 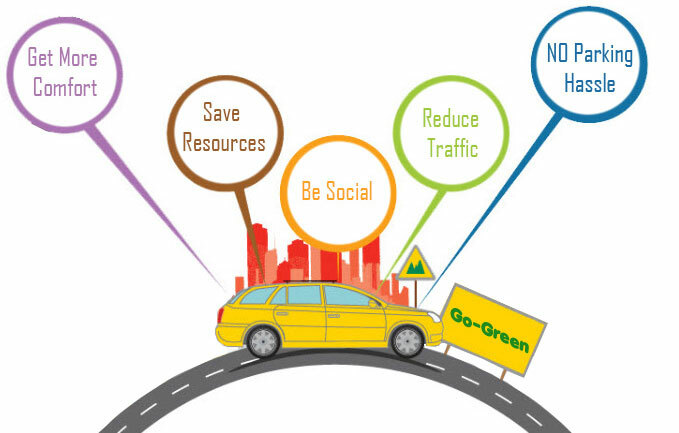 The idea of carpooling is pretty simple – to reduce the horrendous traffic especially in metropolitans. Our carpool APP Make the most of your commute by just joining your local community - friends, neighbors, coworkers saving time & money every day. Our Carpool App helps you carpool with friends, colleagues and environmentally conscious people around your office or home on your daily commute and makes it easy to share empty seats in your car. You Choose the people you want to carpool with based on detailed profiles, and filters like same-route, time etc. Just open the app to see who’s on your route! Our App for carpooling allows you to quickly discover people who need a ride and are headed in the same direction. It helps you build your personal community with trusted carpoolers to share trips every day. •	As a car-owner willing to share a car, offer rides to people from your work, neighborhood or community. As a passenger willing to share a ride, send requests to carpooling drivers and confirm their offers. •	Use the Live tracking and notifications in the App to stay in touch and figure out details like pick-up and drop-off locations. App reminds everyone of upcoming carpools and provides built in notifications for all situations. •	Whether you’re going to work, college or university, there’s always a way in which you could use carpool. Just download the app and take your first shared ride today! • Turn your boring daily commute into an affordable social experience! • As a driver, you can have your neighbors and colleagues help you to finance your car, just by sharing your empty seats. • As a passenger, you will enjoy a comfortable and safe trip while avoiding crowded public transport, switching between many options and standing in never-ending lines. • Meet great people from the community, reduce traffic and help the environment! Share rides and save fuel! •	Detail profiles help to establish the reputation of each member. •	The prompt notifications lets you easily communicate with fellow members and stay in touch. •	Live tracking to stay in touch and figure out details like pick-up and drop-off locations. •	Can do Advance booking for a ride. •	Car owners can post their car information and rides. •	Filtration for users though which user can filter his ride according to Km, Date, route etc.